Place cake mix, oil, eggs, sour cream and vanilla in a large mixing bowl. Blend until smooth. Pour 1/3 of the batter into a small bowl and stir in a few drops of red food coloring at a time until a bright red color is reached. Pour 1/3 of the batter into another small bowl and stir in the blue food coloring. Line your temp-tations® muffin pan with white cupcake liners. Place two tablespoons of the red batter in the bottom of each muffin cup. Add in two tablespoons of the white batter followed by two tablespoons of the blue batter. Gently spread out each layer with a spoon. 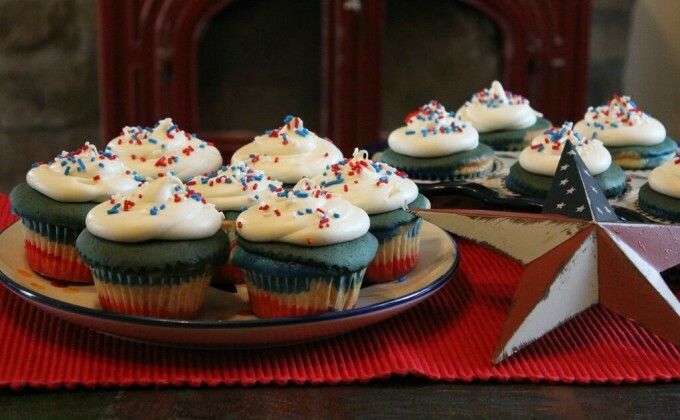 Once cupcakes are completely cooled spread or pipe on vanilla frosting and top with sprinkles if desired.